One of my favorite things about summer here in the south is that you can find peaches everywhere… and if you’re lucky enough to live near an orchard, you can grab a whole box of them without spending a fortune. There’s so much you can do with those peaches. We spent a little time this past weekend and now have a big box of them sitting on the kitchen counter. We made a big batch of ice cream last night and I’m looking forward to “putting up” the rest of what we can’t eat over the coming days. Eat them straight from the box of course (after washing them), but then there’s peach ice cream, peach cobbler, peach crisp, and even savory dishes like peachy crockpot chicken, or something like apple and peach chutney. And do you know what all of those dishes along with pretty much every other recipe have in common? You don’t use the pit. Even when you can or freeze your peaches, those are removed first. Being frugal at heart, I couldn’t just let them go to waste. There’s still so much flavor from the little bits and pieces of flesh left on. 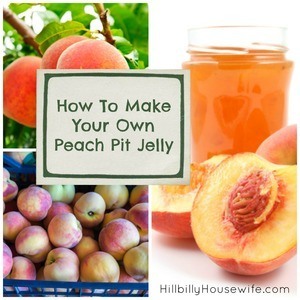 So why not put that to good use and make a batch of peach pit jelly? 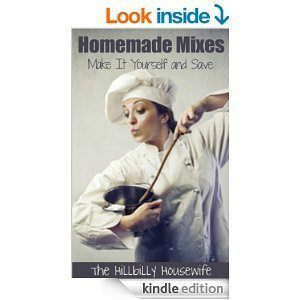 The recipe below is from the very first Kindle cookbook I published – Homemade Jelly and Jam Recipes. Throw peach pits from cooking, eating or canning project into a large kettle, cover with fresh water (a couple inches over the pits) and just set aside on the counter overnight. Note: You want to end up with at least 4 cups of juice after boiling. 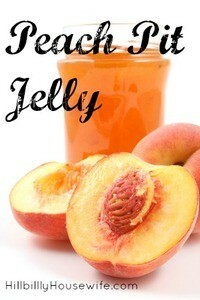 The more pits you have in the pot of water, the richer and darker the jelly will be. The next day put the pot on the stove and bring to a boil, cooking for about 30 to 45 minutes at a nice, rolling boil, but not too hard. Stir occasionally. Remember, you want to end up with 4 cups of juice, so add more water if you need to, and continue to boil. Remove from heat and let sit long enough to handle. Set up a ‘jelly bag’ over a pot, or lay several sheets of cheesecloth in a large colander suspended over a large pot. Pour the mixture into the prepared strainer and allow to strain; do not push or force it. When totally strained, measure 4 cups juice into a large cooking pot, stir in the sugar until it’s dissolved, and put back on medium-high heat to return to a boil. When it boils, stir in the pectin, and return to a rapid boil, stirring constantly, for 1 minute. Yields 4 half pint jars.